The Swell Pendant collection is a trio of aluminum and brass pendant lights with organic forms inspired by the various shapes of a water droplet. Designed by Pablo Pardo in 2014, the Swell Pendants can be used alone or actively grouped together as a larger featured lighting element within a space. The Swell Pendant collection comes in three distinct shapes and sizes: Narrow, Medium and Wide. The Swell Narrow Pendant has a width of 8” | 20 cm and a height of 14” | 36 cm. The Swell Medium Pendant has a width of 12” | 30 cm and a height of 12” | 30 cm. The Swell Wide Pendant has a width of 16” | 41 cm and a height of 10” | 25 cm. 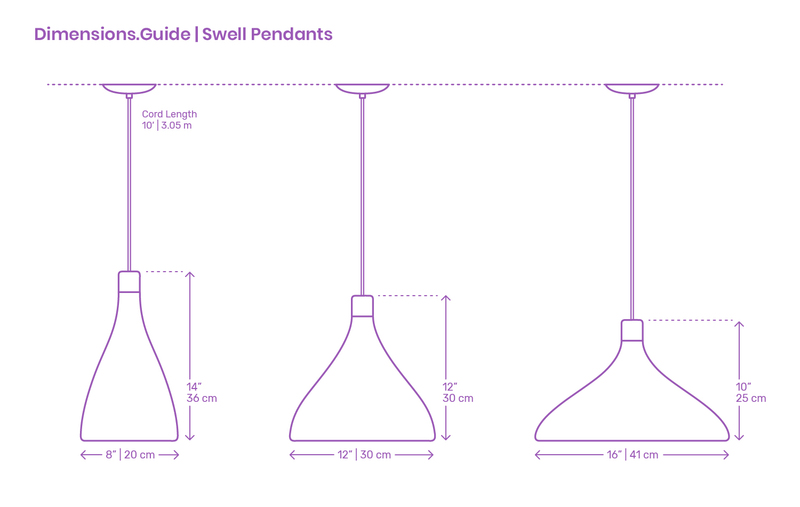 Swell Pendants have a cord length of 10’ | 3.05 m.
What is the Swell Pendant collection? The Swell Pendant collection is a trio of aluminum and brass pendant lights designed by Pablo Pardo (2014) that feature organic forms inspired by the various shapes of a water droplet. How big is a Swell Pendant? The Swell Pendant collection comes in three distinct shapes and sizes. The Swell Narrow Pendant has a diameter of 8” | 20 cm and shade height of 14” | 36 cm. The Swell Medium Pendant has a diameter of 12” | 30 cm and height of 12” | 30 cm. The Swell Wide Pendant has a diameter of 16” | 41 cm and height of 10” | 25 cm. How high should Swell Pendants be hung? Though the collection contains a variety of pendant sizes, the bottom of each Swell Pendant should be hung 28”-36” | 71-91 cm above a countertop surface or 30”-36” | 76-91 cm above a dining table.